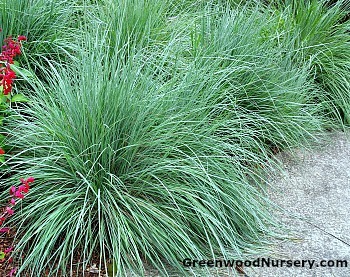 Schizachyrium scoparium 'The Blues', commonly called little bluestem, is tolerant of high heat and humidity. New growth sprouts are greenish blue maturing to red and deep blue. Silvery white flowers of the Schizachyrium scoparium appear in late summer becoming more showy as the foliage fades to shades of burgundy. Little bluestem is an easy to grow perennial. Excellent companion plants for the Schizachyrium scoparium 'The Blues' are coreopsis, coneflowers, daylilies, and butterfly weed plants. Orders shipping to AZ and CA will be bare rooted before being prepped for shipping.